1* Take photo handier:When traveling out with an phone lens，whether it is shooting landscapes or self timer are very handy. 2* Take phone professional:For every perfect moment,perfect visual experience for you,make your mobile phone a second variable SLR,allows you to easily take a professional photos. 3* Wide-angle lens:Wide angle lens perspective,wide vision.can show a considerable range of clarity,make the screen more shocking. 4* Fisheye lens:fisheve lens is close to a subject when shooting can cause a very strong effect on,emphasize the contrast object near the small,the appeal of picture is a stirring. 5* Macro lens:Macro lens is a special lens for macro photography,mainly ysed for shooting very tiny objects,such as flowers and insects etc. 6* Telephoto lens in use,are generally used to shoot distant scenes,Because of its depth of field range is smaller than the standard lens,so it can more effectively blur the background highlight the focus of the main body. 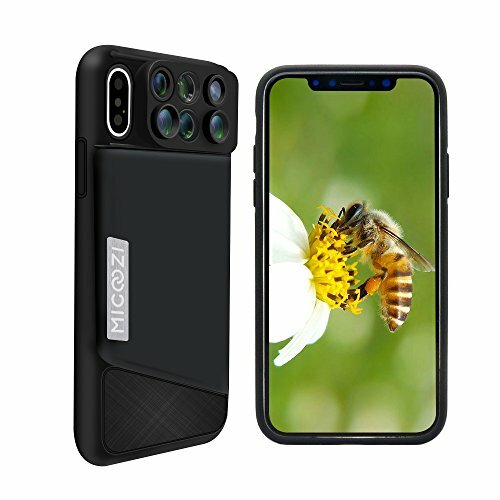 For iPhone X lens:more convenient to carry,easy to switch the lens,is suitable for mobile travel camrea lens. 【 Telephoto lens: 】 Using the telescope lens requires the camera to be set to the 2X optical zoom mode, in this way you could shoot a distant view.Because of its depth of field range is smaller than the standard lens,so it can more effectively blur the background highlight the focus of the main body. For Every Perfect Moment,Perfect Visual Experience For You,Make Your Mobile Phone a Second Variable SLR,Allows You to Easily Take a Professional Photos. 【 Wide-Angle Lens: 】0.65X Wide Angle Lens Perspective,Wide Vision.Can Show a Considerable Range Of Clarity,Make The Screen More Shocking.